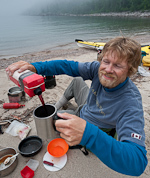 Canadian Canoe Routes • View topic - Double sleeping bags - A better way for couples to sleep? Double sleeping bags - A better way for couples to sleep? Post subject: Double sleeping bags - A better way for couples to sleep? My wife and I were on a trip on the French river in September in which the nights were cool. We brought a couple with us. They're a new couple, one a rookie to paddling and the other a two of decades away from his last trip. I was concerned if they had stayed warm during the night so I inquired and I was a bit surprised when they said they were toasty. They had opened up the one rectangular sleeping bag and used it as a big blanket. This got me thinking. Of course I had always known that some people take two rectangular sleeping bags and zipped them together to make a double bag but I've always found that its the drafts around the neck that make for an uncomfortable night if you don't have the the hood of your mummy bag done up. Thus I've dismissed the double rectangular bag idea as impractical for our needs. Now I usually manage to stay warm but my wife frequently seeks to push her bag up next to mine to stay warm. Yes, we've mastered the placement of the air mattress couplers and she has a nice bag and liner. So the feedback from our friends lead me to think about a better way to sleep on our trips and my research on double sleeping bag products on the market began. I did a search in this forum and the last post on this topic I could find was from four years ago. Things change in the market in that period of time so I thought I'd seek more input from the forum's collective wisdom. There are a few manufactures in the market that make double sleeping bags with hoods. Sierra Design, Big Agnes, The North Face, Nemo and Kelty make bags with hoods. So have any couples out there had any experience with any of these double bags? Is it a nicer way to sleep while tripping? We use a single down rectangular bag (MEC Cygnet, no longer available). I made a sheet bottom that zips to it. This saves a lot of weight and bulk, especially important on a recent backpacking trip. In warm weather we need to keep the bag unzipped, which creates a problem because the sheet tends to bunch up on the pads. I solved this by making ties at the corners that connect to the pad coupling straps, holding the sheet in place. In cooler weather we take a small fleece blanket to put over our heads if needed. Fleece is quite nice to sleep under in cold weather because it is quite permeable, and the blanket can be moved around for the right balance of warmth and air flow. The fleece dries quickly if it gets damp from our breath. Do we really need to sleep in the same bag while camping? My wife and I have different blankets on top even at home. I've been a fan of double bagging it for years. The R value of even cheap sleeping bags goes way up when you zip two of them together and put two bodies in it. I have no experience with the hooded ones, I think I would rather wear a toque, a hood with a double bag might get kind of ....I don't know, difficult to move around or something. My wife is always cold when she is in her own bag, not so when we double bag it. My wife is a cold sleeper compared to me. We bought matching tapered/barrel bags with zippers left and right so we could double them up. We made sure they would by zipping them up in the store. We don't always double them up on trips, only on extra cold nights. Otherwise she tucks a wool blanket inside her bag or drapes it over her as an extra measure against the cold. I just put on a toque and wear wool socks. Sleepwear is important too. We like thin merino wool. Most MEC hooded mummy bags with opposite zippers zip together. My wife is a cold sleeper compared to me. Otherwise she tucks a wool blanket inside her bag or drapes it over her as an extra measure against the cold. I just put on a toque and wear wool socks. Sleepwear is important too. We like thin merino wool. Mine too, but in the extreme. She will have on pajamas under a blanket and comforter, and I’ll be naked trying to keep a sheet from sticking to me. When we first married we splurged on two quality sleeping bags that could be zipped together. They were occasionally used in that fashion, but never really for sleeping. Still good bags, and we still use them. Amen! Plus you each get to make up your own side of the bed in the morning, just how you like it (ie, loosely draped sheets and blankets, not foot entrapped at bedtime via hospital corners). Unless it is stupid freaking cold out I rarely zip a sleeping bag fully closed, and I have never deployed a mummy style hood. Well, maybe once, and then decided I’d rather wear a thin knit cap and wake up with ice in my beard rather than sleep mummified constricted with an air hole cinched around my face. That full-mummy doesn’t work very well if you are a toss-and-turn side sleeper. Most often, I use a sleeping bag just like winter blankets at home. We keep a cold winter house, and don’t heat the bedrooms; all of us sleep with a fresh air window at least cracked open. When the inlaws visit they bring sweaters and jackets to wear inside. . . .but they still visit. I much prefer a sleeping bag simply draped over me; easier to turn from side to side, and easier to stick out my feet or arms for some temperature regulation if still too warm, and to tuck fully under at 4am when it gets chillier. Not to mention 3am old-man micturations; getting zipped out, and zipped back into that awkwardly restrictive cocoon, vs just crawl back under something top quilt-ish and tuck in. One oddity with that open sleeping bag guise; heavier synthetic fill bags, or layered blankets, do a better job of draping form-fitted-against-body than down bags. The light loft with a down bag leaves chilly /O\ voids on the sides that I am constantly trying to keep tucked tight against me. In lieu of a designed top quilt I’ve gone to rectangular or semi-mummy bags with a full bottom zip. Even the zero F bag is a rectangle, and as extra wide one at that. I have on occasion zipped it fully closed on well-sub-freezing nights. Luckily it is wide enough that I can still turn side to side inside the voluminous bag without ending up in a double helix bag with the zipper wrapped around me. Help, I’ve twisted and turned and can’t get out. And I really need to pee. Oops, end of impending mummy bag rant; they just don’t work for me. For a zipped-up sleeper I like the two-temp concept of a “Flip” bag, with different temperature ranges on either side. We have one; a 30F/50F flip down bag. Nice summer/shoulder season choice. If you sleep in a zipped up bag. If you habitually sleep with an open bag as blanket, not so much. The dividing line between the nicely down filled 30F side and the 20 goose feathers and two layers of nylon 50F side ends up positioned directly above your personal keel line, and neither side is comfortable. Thanks for the feedback! So far a few of you have voiced you preference for the double sleep bag options but not as many as I thought there might be. Just wondering if double bag users are few and far between or I just haven't given enough time for responses yet. Interesting idea about a sheet around the head Kinguq. Like RH I always have a toque packed and wear it on colder nights. Historically I've found that only ways to stay warm (in a mummy bag) when it's really cold outside is to only expose the face. Figuring the extra body heat in a double bag would compensate but still worrying about drafts which historically I have found to be the enemy. An yes MM I can relate to twisted bags and limited range of movement in a mummy bag though I don't think I sleep quite as hot as you. Thus my inquiry about what seems to me at least as a new series of bags for two. Prospector16, remember I keep warm enough but I'm thinking of my wife's comfort. Plus I tend to frequently sleep with my arm over my head at home and these new double sleeping bags with hoods look like them might provide an option for sleeping that way on a cold night. Hanging my arm out of my bag is just too cold some nights. The North Face Campforter Double Bag promotes that potential arm placement as a benefit. It was the Sierra Design was the bag that first caught my eye on the double bag topic. The idea of no zippers and being able to have my feet hang out the bottom of the covers like I sleep at home sometimes was a big attraction but being 6'3" bag length is a major consideration for me. Big Anges has a couple of design options and if you really wanted ultimate room without a worry for weight then this one looked like it rocked. The idea that I really like about all of these bags was that they connected the sleeping bag to the sleeping pad so that if the tent site was on a slight slope you wouldn't slip off your pad. Yes, a big differential in warmth requirements between my wife and I and knowing that during a longer trip you can experience both really cold and really warm nights has me hesitating a bit on the purchase of one of these bags. That and wondering if there is enough room. If I'm congested I'm prone to snore and on those nights my wife can't get far enough away from me. That said she has learned to bring foam ear plugs along and not just because of me. She doesn't sleeping beside a loud waterfall which seems to frequently happens on our trips. Would love to hear more input. PS. Good thought but I don't think putting a left and right zippered mummy bags together would work. One of the hoods would be facing the wrong way. Maybe consider a couple of down throws? I got a couple at Costco (~$30) and they can be deployed wherever needed - or not at all. If one of you sleep "hotter" than the other it will give you a little more range. Same basic concept as the home bed with separate blankets They are so light and packable that I always have one with me though I rarely actually use it. Hmmmm. Yes, that would definitely be cheaper than and new double bag. this is a LONG post with links at the bottom. I do sew, so before I went to a systems I tried various things to go with the sleeping bag, but I could never get the bottom sheet so that it would not wrinkle for pull off (Or dry as quickly). I research products to exhuastion, and I am tight with a buck, but again, never happier, so worth it. I have put other links below of other systems that have come out since. I do sew, so before I went to a systems I tried various things to go with the sleeping bag, but I could never get the bottom sheet so that it would not wrinkle for pull off (Or dry as quickly). It couples the mats perfectly, and packs to about the size of a very light baseball. I research products to exhaustion, and I am tight with a buck, but again, never happier, so worth it. They all do seem to come on sale in the fall. I have put other links below of other systems that have come out since. We loved it so much, we ditched out old woods Thinsilate for 2 more quilt systems that we share between te 4 in the household. The Thermarest Vela (https://www.altitude-sports.com/product ... -tar-09181 great service!). is large enough for the 2 of us when we have to use our old 25" thermarest mats, or if it is really hot out. I also use it as a single because I do a lot of tossing, turning and throwing back the quilt, and I often camp separately from my husband. My husbands Apogee (MEC) is a slightly smaller one. We did purchase the original fitted sheet in large and xL to fit both 20" son's mattress and our Exped downmatts, and all of the quilts mate with these as needed. The Apogee is the Vela, only instead of down fill it is synthetic. Remember, some companies have paired down the styles they are making, so even if you don't find an item on their website, you will find it somewhere are old or clearance stock.! Great post, thanks Cheryl. lots of good stuff there. You must be newlyweds. Eventually it will dawn on you that a good night's sleep is more important than zipping your sleeping bags together, and any attempt to arrange things otherwise will be futile. We used to try the zip-together thing. We even had a coupler kit for our therma-rests. Neither of us ended up getting a solid night's sleep, so we abandoned that idea many years ago. Sure, my wife & I can "snuggle... " in the tent, but when it comes down to getting some serious sleep (and staying warm on a chilly night) we retreat to our separate sleeping bags. My wife and I have been together over 30 years, so I guess the dawn is delayed. We always share a bag system, except perhaps in the deepest cold of winter. For us, and I suspect for many others, it is the warmest and most comfortable and simply the best way to spend the night. My wife and I tried the double bag thing. Didn't work for us. So I do have a double bag that was only used once if someone wants to buy it.... pm me. I will put some details up in the classified section if people are interested.